Albertosaurus was a carnivorous (meat-eating) dinosaur that lived in the late Cretaceous period, approximately 76 to 74 million years ago, in North America. It was a bipedal (walking on two legs) creature, with tiny two-fingered hands, and a massive head containing dozens of large sharp teeth. Albertosaurus was around 26 feet (7.9 meters) long, and weighed approximately 3 tons. It was much smaller than its relative Tyrannosaurus Rex. The first specimen discovered was a partial skull discovered in 1884 from an outcrop near the Red Deer River in Alberta, Canada, and was initially incorrectly assigned to the the species Dryptosaurus (also known at the tim as "Laelaps incrassatus") by Edward D. Cope. The name Albertosaurus was coined by Henry Fairfield Osborn, in a brief note in his 1905 paper describing Tyrannosaurus Rex. About 30 fossil specimens of Albertosaurus have been found to date. This includes 22 individuals found at a single site, which is highly suggestive of pack behavior. Finally, it is worth noting that some paleontologists have suggested that the Asian Tyrannosauroid, Alectrosaurus, may actually be a species of Albertosaurus. 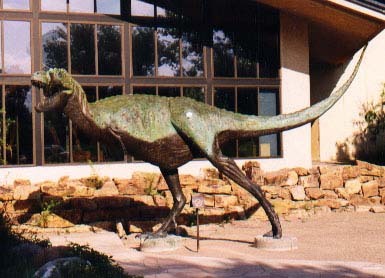 Lifesize model of Albertosaurus outside the New Mexico Museum of Natural History and Science in Albuquerque, New Mexico. North American Dinosaurs - Albertosaurus lived in North America. Albertosaurus was a genus of dinosaur. "Albertosaurus" means "Alberta lizard" (after the province of Alberta in Canada). The name was chosen by Henry Fairfield Osborn in 1905. Albertosaurus was a member of the Saurischia ("lizard-hipped") order of dinosaurs. What this means, is that although Albertosaurus was not closely related to lizards, it did have similarly shaped pelvic bones. Albertosaurus was a Theropod - a member of a group of related bipedal dinosaurs that included the ancestors of birds (although Albertosaurus was not itself an ancestor of birds). Albertosaurus lived between about 76 million years ago and 74 million years ago, during the late Cretaceous period. Albertosaurus lived in North America. 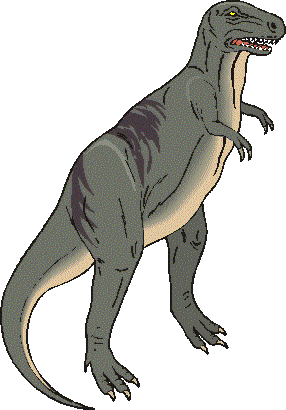 Albertosaurus was a carnivore (meat-eater). Albertosaurus may well have been a pack animal with several individuals working together to bring down prey. Fossils of 22 individuals were found together at one site, which is the reason why scientists think that Albertosaurus was a pack hunter. Albertosaurus was about 26 feet (7.9 meters) long. Albertosaurus weighed about 3 tons. With its huge head, rows of pointed teeth, and sharp claws, Albertosaurus was so scary. Tag along with a group of Albertosaurus on a hunt, then meet Styracosaurus, with its horn-rimmed neck frill; Gallimimus, one of the fastest dinosaurs; a crafty predator called Alectrosaurus; Polacanthus, a timid plant-eater with spiked back; and Lambeosaurus, a large, fast-running duck-billed plant-eater. Albertosaurus' name may not sound very fearsome, but this was one deadly dino. Readers learn about this prehistoric predator from engaging text and bold illustrations reviewed by Smithsonian experts. When you're a dinosaur, there's only one thing to fear: the dinosaurs that are bigger than you! How do the jaws of a T.Rex measure up to those of a shark or a lion? How could an Allosaurus eat as much as it did without getting sick? What happens when an Albertosaurus takes on a Carnotaurus? Bite of the Allosaurus is a snarling, bone-crunching look at the biggest beasts that ever lived! In The Tiny Titanosaurs, young readers journey to Argentina with paleontologist Luis Chiappe as he makes a major discovery. Amidst a nesting ground filled with thousands of dinosaur eggs, Luis and his team were the first to find both skin and bones from unhatched baby dinosaurs. If the babies had survived, they would have grown to be some of the largest animals that ever walked the earth. What disaster kept the eggs from hatching? Discover the answer with Luis and his team. Full-color photographs, a map, and an exciting narrative text will inspire the budding fossil hunter in every child. Chronicles the life and death of an Albertosaurus, distant cousin of the Tyrannosaurus Rex, while reporting the activities of one excavation in Canada. 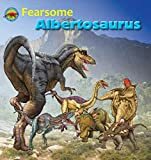 A pack of Albertosaurus hunt for prey and attempt to protect an injured member of their troop before getting caught in a fire, in a story that also includes information about Albertosaurus. Add prehistoric pizzazz to arms, legs, and elsewhere with these colorful dinosaur tattoos. A dozen specimens include gigantic herbivores such as apatosaurus and stegosaurus, plus albertosaurus, tyrannosaurus, and other towering carnivores. Includes instructions for safe and easy application and removal. Wondering what’s happening with the weather? See whether meteor showers are here to stay with our fail-safe forecast. Experience Jurassic World dinosaur battle play in a whole new way! 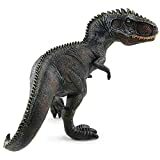 Proceratosaurus Jurassic World Posable Dinosaur 4"
【Kids's safety always comes first】High quality vinyl and soft glue material, odorless and non toxic. Abusolutely safe and durable for kids play with. Non-toxic and soft. Kids's safety always comes first, we care detail. 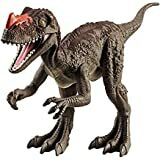 【A great addition to your kid's toy shelf】This rubbery dinosaurs will be a perfect gift for those child who is crazy about dinosaurs and collects models of them. It has model quality for anyone that might just want to keep it on shelf. 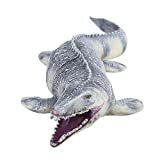 【Great decoration in kid's room】Mosasaurus is an amphibian, and also is the biggest predator in the Mesozoic ocean, this model toy can cultivate children's cognition of natural world, learn more about dinosaurs.It can be great Christmas gift for children, or as display model, also great decoration in the room. When you kid goes around the house roaring and doing battles with his other dinosaurs especially Mosasaurus, or play battle with his cousins. A lot of toy fun can be his memories. If you child is passionate about learning and playing with dinosaurs, this dinosaurs would be recommended to kept as a child present. A few young couple feels pretty hard for the toddler's speech education. May you are worrying it is helpless as you can do nothing for your 3 year old son. Never mind. Obviously, this Fdit dinosaurs are manufactured to help toddlers to explore the world. Fdit is a selfless and careful houseware craftsman, he devotes himself to provide home-kitchen supplies to the common folk. We take each order seriously while our customers choose our dinosaur toy, because it is about your kids' fun. This is not a joke. we recognize you enjoy staying with kids, since that newborn baby came into this world. Not only a 6 years child, but also a 26 years old adult. The fever that people loves dinosaurs has never stopped. Because it will be a real hit with them, which made it an excellent gift to them. It will be better if you can gave it accompanied with a book about dinosaurs, to help your child to learn new names of animals. 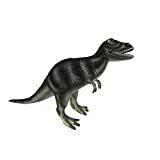 This model toy can cultivate children's cognition of natural world, learn more about dinosaurs. To meet more requirement for dinosaur toys, we will develop liopleurodon, triceratops, pterosaurs and related dinosaurs soonest. 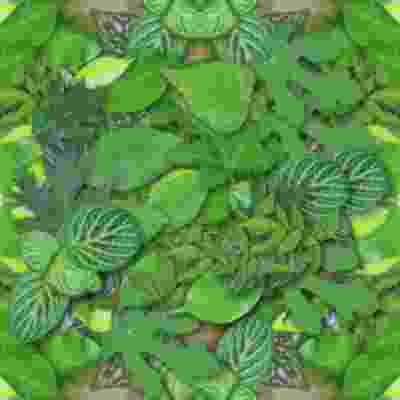 Please allow slight deviation for the color and measurement. Thanks for your understanding. Experience Jurassic World dinosaur battle play in a whole new way! Jurassic World Dual Attack dinosaur action figures come in a medium size and have dual-button activation for fierce battle action iconic to each respective species! For example, push the back button and the tail strikes; press the front button and the head strikes! You can also press both buttons at the same time for dual tail and head-striking action! These dinosaur action figures have movie-inspired sculpting, an articulated head and tail, authentic color and realistic texture. Recreate all the epic Jurassic World battle action scenes with these Dual Attack dinosaur action figures that are medium size and perfect for collecting! Choose from the Concavenator, Parasaurolophus, Triceratops action figures and more (each sold separately, subject to availability). Each dinosaur comes with a cool Dino Rivals collector card detailing its key battle stats and attributes. For more dinosaur fun, download the Jurassic World Facts app (Android and iOS) to scan and watch each dinosaur come to life, learn attack facts, compare stats and more! Be a part of the Jurassic World adventure with the ultimate in dinosaur rivalry and battle action! 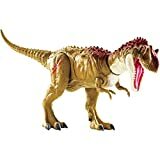 These smaller-size dinosaur action figures capture the ultimate movie action with their Savage Strike attack moves iconic to their respective species. Play out movie action scenes with Savage Strike attack moves like biting, head ramming, wing flapping and more. Just press a designated area on the dinosaur action figure to make it move (each dinosaur activation varies). Figures also include articulated arms and legs, realistic sculpting and authentic decoration. Get ready to battle it out—Savage Strike style—with these fierce action figures! Each sold separately, subject to availability. Each dinosaur comes with a cool Dino Rivals collector card detailing the dinosaur's key battle stats and attributes. For more dinosaur fun, download the Jurassic World Facts app (Android and iOS) to scan and watch each dinosaur come to life, learn attack facts, compare stats and more! 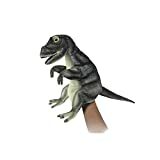 21100029 Features: -Albertosaurus claw. -Dino Museum collection.